Ayurveda translates into English as the Science of Life (Ayur - life, veda - science). Ayurveda is the oldest and most developed life science of natural healing in the world. Life is the outcome of the union of body (Sharir), sense organs (Indriya), Psyche (Mana) and Soul (Atma). Ayurveda is not merely a system of Healing, but an entire way of life that aims to bring about the perfect balance of the entire personality - body, mind and spirit. Ayurveda is based on theory of tridosha of the three Biological forces - Vata, Pitta and Kapha. Disease arises when there is an imbalance among the three Doshas and aim of the therapy is to bring about the required equilibrium. 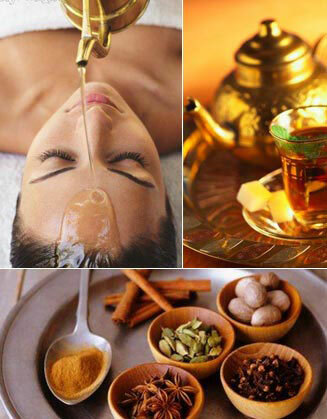 Ayurveda is a system of healing that was originated in India thousands of years ago. Historical evidence of Ayurveda could be found in the ancient books of wisdom known as the Vedas. In Rig Veda, the oldest of the vedas, over 60 Ayurvedic preparations were mentioned that could be used to help an individual in overcoming various ailments. The Rig Veda was written over 6,000 years ago, but really Ayurveda has been around even longer than that. Ayurveda is more than just a medical system. It is a Science of Life. Ayurveda is a science in the sense that it is a complete system. It is a qualitative, holistic science of health and longevity, a philosophy and system of healing the whole person, body and mind. This system evolved at a time when philosophy and medicine were not separated; hence philosophical views have strongly influenced the Ayurvedic way of thinking. The word, Ayurveda, derived from the ancient Indian language, Sanskrit, means “Knowledge of Life”. Ayurveda’s basic principle is the concept that you are capable of taking charge of your own life and healing. As per Ayurveda there are three main energies that combine to form all things in the universe. These are recognized as being fundamental to all life and are seen in the processes of growth, maintenance, and decay. Their actions are named anabolism, metabolism, and catabolism in the western sciences. The Vata dosha is the most important of the three doshas. In the classic Ayurveda books it is quoted that other doshas are lame without the help of vata. The elements combine with Ether and Air in dominance to form what is known in Ayurveda as Vata Dosha Vata dominates the lower part of the body, which is below umbilicus. The movements of body fluid, metabolism, elimination of waste products, relaying stimulus to brain and response to organs and tissues, heart beat, respiration, body movements etc are assisted by VATA. Vata dominated regions are intestines, lumbar region, ears, bones and skin. Finally, it is predominantly the water and earth elements, which combine to form the Kapha Dosha. Kapha is responsible for growth, adding structure unit by unit. It also offers protection, for example, in form of the cerebral-spinal fluid, which protects the brain and spinal column. The mucosal lining of the stomach is another example of the function of Kapha Dosha protecting the tissues. When the three Doshas are well harmonised and function in a balanced manner, it results in good nourishment and well-being of the individual. But when there is imbalance or disharmony within or between them, it will result in elemental imbalance, leading to various kinds of ailments. The Ayurvedic concept of physical health revolves round these three Doshas and its primary purpose is to help maintain them in a balanced state and thus to prevent disease.